The ICE survival tool is 3.375" tall, 2.125" wide and weighs only 1.4 ounces! It features a lifetime warranty. 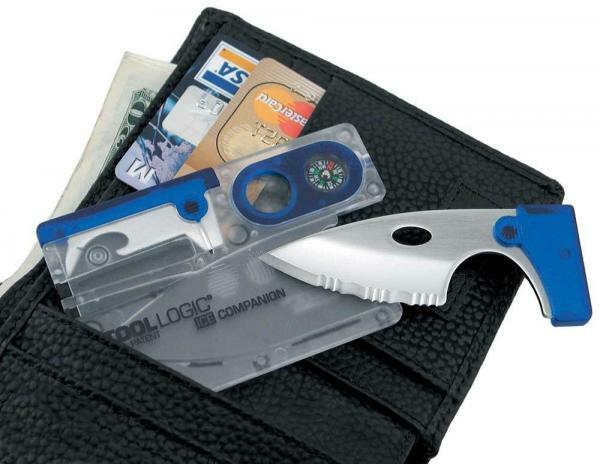 It's made by Tool Logic, one of the leading makers of credit card-sized multipurpose tools. This little thing is great as an every day carry (EDC) tool that you can just keep in a wallet, pocket, backpack or purse. If you're worried about your wife needing something to survive on but there's no way in hell she'll carry a bugout bag, this little tool is perfect - just slap one in her purse! In reality, it's not going to help you survive in the wilderness all on it's own. However it's going to help big time and might buy you some time, and that's really what it's all about. After all the best survival tools are the ones you have on you, right?